Washington principals face a growing teacher shortage. How are they filling classroom vacancies? As principals in Washington scramble to fill a growing number of open classroom jobs, they’re relying more and more on partially trained teachers, new state data suggest. The data, released by the Professional Educator Standards Board earlier this month at a conference about diversifying the teacher workforce, also show that school districts appear to be recruiting and retaining more teachers of color. State lawmakers, meanwhile, have advanced legislation to both address the overall shortage and remove barriers that prevent aspiring teachers of color from entering the profession. “The number of teachers of color has been increasing. … That makes us happy (but) we do have a long ways to go,” said Maren Johnson with the Professional Educator Standards Board, which oversees the training of teachers and paraeducators in Washington state. Johnson co-wrote a new report that focused on teacher-hiring data as of the 2016-17 school year, the most recent available. 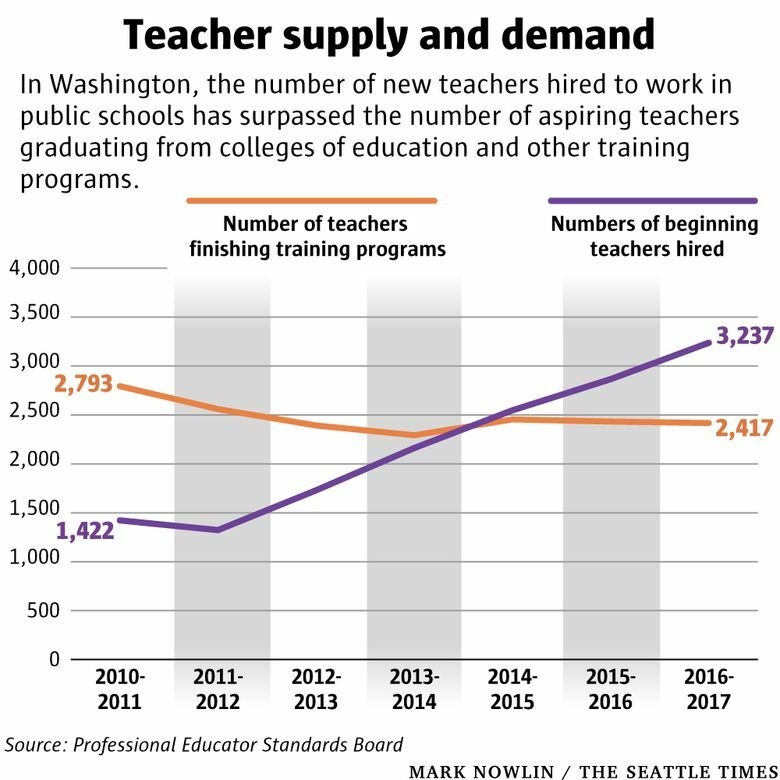 The report found that the number of new teachers hired each year in Washington more than doubled from a low about 1,323 in 2011-12 to 3,237. But, according to the report, the actual amount of new teachers graduating from colleges of education in the state or finishing other training programs has remained pretty much flat since 2010, leaving a shortage for 820 classroom positions in 2016-17. To fill those positions, the report indicates that principals may be relying on aspiring teachers who haven’t yet graduated from college or finished another training program. In fact, the number of certificates issued to allow partially trained teachers to work in schools more than tripled from about 3,000 in 2011-12 to 9,251 last school year — “a clear indicator of an educator shortage,” the report said. Johnson added that it’s too soon to tell whether recent teacher pay hikes — driven by a court-ordered infusion of cash into the state’s K-12 budget — have made an impact on the number of classrooms without teachers. “We don’t yet know the impact, but we need to follow that,” she said. As for educator diversity, the report detailed the demographic hiring data for every school district in Washington. In Seattle, 22 percent of all new hires over the past three years identified as teachers of color, compared to a 16.6 percent statewide average. And while teachers of color tend to leave the classroom sooner than their white colleagues, districts seem to be reversing that trend: The share of teachers of color who remained on the job after three years rose from just about 59 percent in 2010-11 to 72 percent in 2014-15. Gov. Jay Inslee recently appointed Adam Aguilera, a 10-year teacher in the Evergreen school district, to the Professional Educator Standards Board. Aguilera previously worked with the board to study why aspiring teachers of color disproportionately fail a skills test that every teacher must pass before the state allows them to work in a classroom. Last year, The Seattle Times and The Columbian newspapers featured that study in a series about the barriers — and solutions — to increasing teacher diversity in Washington. Aguilera, however, noted that recently, the state House of Representatives unanimously passed a bill that would remove that skills tests as a requirement to teach here. The House also — nearly unanimously — advanced a separate bill that would support training programs with track records of producing more teachers of color. Both pieces of legislation now await votes in the Senate.